Bangkok, March 24 (IANS) About 50 million voters headed to the polls in Thailand for the first general elections since the 2014 coup. All 750 representatives from the two houses will vote together to elect the next prime minister. Fifty-one million people are eligible to vote, including 7 million young Thais who will be participating in their first ever election. 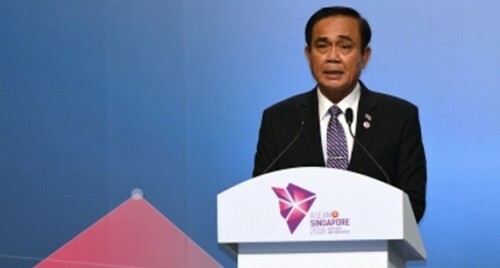 Sunday will be the first time Thais have the chance to vote since a bloodless coup in 2014, led by incumbent Prime Minister General Prayuth Chan-ocha, overthrew the elected government of Yingluck Shinawatra, the sister of former Prime Minister Thaksin Shinawatra. Both are living in self-imposed exile after being found guilty in absentia of corruption and sentenced to five year prison terms. Sunday's elections are also the first since a new constitution enacted following the death of King Bhumibol Adulyadej in 2016 banned large parties and ensured that the military oversees a 20-strategic plan, regardless of which party wins the polls. The constitution, approved with the promise of providing stability to the country and preventing a potential stalemate in parliament, gives the military establishment powers to nominate all 250 members of the senate (the upper house) for a five-year term. Bhumibol's son and successor, King Maha Vajiralongkorn, made a surprise statement late Saturday night urging the Thais to elect "good people" to rule and not prevent "bad" people from "creating chaos". That announcement came just two months after a royal decree barred his eldest sister, Princess Ubolratana, from running as a candidate for prime minister. The Thai Raksa Chart party, which is linked to the Shinawatras, had nominated the hugely popular and respected princess in an attempt to swing the vote against parties backed by the ruling military junta. But after the King called the move "highly inappropriate", the party was dissolved by the electoral commission in a major blow to the Shinawatra clan. Pre-election surveys indicate that the Shinawatra-backed Pueu Thai, which was overthrown in 2014, will secure most of the votes on Sunday, while pro-military parties, such as Prayut's Palang Pracharat, are not expected to fare well. The Democrat Party, the country's oldest, which is popular among the middle classes and in the south, as well as the newly-formed Anakot Mai (Future Forward), which is hugely popular among younger voters, are also expected to win significant numbers of seats in parliament.